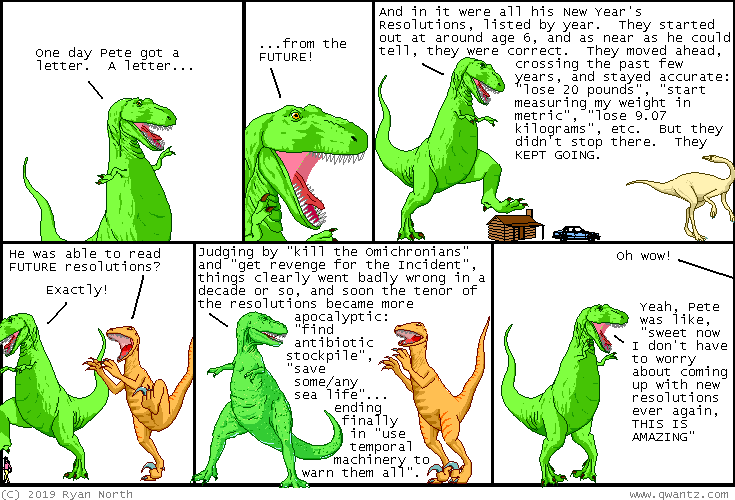 Dinosaur Comics - January 2nd, 2019 - awesome fun times! January 2nd, 2019: HAPPY 2019! This is the most surreal part of the year for me, because it's the part of the year where I get to change the copyright date on the comic, way down there in the lower left-hand corner, moving the "8" to a "9". I started this comic in 2003 and never expected I'd make it past the year, let alone over FIFTEEN of them! So thank you so much for making that possible. You are individually and collectively the best! The comic's birthday is the 1st of February and I'll have more to say then! For the last week of LAST year I re-ran some CLASSIC COMICS that I found. In case you missed them, they were from July 13th, 2016, December 5th, 2012, and Friday's was from December 7th, 2012, and December 10th, 2012.